Comment below to the post question: Who is Kylo Ren? There’s disturbance in the Force. 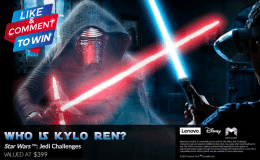 Arm yourself with this #AugmentedReality lightsaber and train to become a Jedi Master with Star Wars: Jedi Challenges. Players can perfect their lightsaber skills by taking on some of the most menacing villains the Dark Side has to offer, command Rebel forces. Lightsaber controller – Experience what it feels like to wield a lightsaber for the first time – to face-off against enemies right in your own living room. Feel your opponents’ attacks with force feedback. Lenovo Mirage AR headset – The Lenovo Mirage AR headset is ergonomically designed for maximum game immersion. Tracking beacon – The beacon ensures accurate tracking of your location, while expanding and filling in the environment around you with an immersive augmented reality universe. May the Force Be With You! NOTE: Compatible smartphone required. Values at $399. T&Cs apply.